Paramo says:"The latest multi-activity garment from P�ramo with advanced ventilation features providing high performance in the widest range of activities. 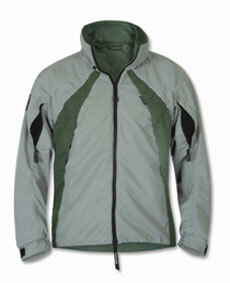 Climbing and cycle friendly, this jacket offers intelligent design combined with a contemporary look." Less prone to abrasion or damage through reversed zips. Front zip provides 'two-phase' venting option. Fully adjustable, wired and roll-away/detachable low profile hood with multi-option collar storage. Maximum freedom of movement and increased comfort in the shoulder and arm area provided by articulated shoulders and sleeves. Less flap and weight through reduced arm volume. Adjustable venting and temperature control, with no restriction to movement or comfort through our upper arm vents. Further temperature control and weather protection from our multi-adjust cuff design which also allows sleeves to be rolled up for cooling. Excellent weather protection in all conditions from our 2" drip skirt and scooped tail. Single-handed hem drawcord pulls help to eliminate rucking when load carrying and to retain body warmth when required. Reflective piping front, back and sides. Single-handed 'on the move' cuff adjustment provided by the 'BiteTab' closure. Two hand warming/storage chest pockets, zipped with hook and loop secure flaps. I was looking for a jacket that I could use hill-walking but also wear as I get into Nordic Walking. I tried the Paramo Vasco on several rainy trips, early Autumn in mountain areas of Trentino (Northern Italy) and in the Derbyshire Peak District. Fit : The body and sleeve length on me (5' 7'', average build) were good. The slimmer fit plus the design of the sleeves and shoulders made this really comfortable for both hill-walking and for Nordic walking - when the pole swing means your arms are being used more vigorously. Whilst it's a shorter fit than eg Cascada - it still offered perfectly adequate protection. The 'scooped' tail provided additional coverage at the back and stopped any riding-up under my back-pack. Temperature Control/Comfort: I wore this with just a short-sleeved, breathable top underneath the jacket. The multitude of options for ventilation (2-way zip, underarm vents, back vents, sleeves that stay rolled-up) really did work in helping me stay comfortable throughout the day whatever my exertion level. As I'd expected, the breathability was excellent. Hood:The hood is fully adjustable and can be rolled away or detached. The peak is quite small, though, which would reduce it's usefulness in more extreme conditions. Other features: There's a good size pocket at the front that is big enough for an OS map plus two 'hand-warming', zipped pockets. The reflective piping ion the back is certainly a useful feature should you find yourself finishing the last few miles of a walk in the dark. At 810gms, those who demand ultra lightweight gear may consider the Paramo Vasco a little heavy. But for the rest of us this really is a superb jacket that you can use for any number of outdoor activities. At 810gms, those who demand ultra lightweight gear may consider it a little heavy. But for the rest of us this really is a superb jacket that you can use for any number of outdoor activities. It's warm - but the multitudinous ventilation options mean you can pretty well wear it throughout the UK autumn/winter/spring. And it looks pretty good as well.